Congrats! You just landed the perfect social media internship! The company loves that when it comes to social media, you are young and “in the know,” and they put you in charge of posting content. The only problem is you only work twice a week and they want you to post on social media every single day. What do you do? You can take time out of your days off to post OR you can schedule your social media posts. The following are the tools that save me time and make my boss happy. This social media platform has been around forever, or so it feels like. The latest additions to the site include a post scheduling system. This feature allows you to create content and schedule it to post at a certain time and day. This particular platform is known for quick and short updates. Companies are constantly wanting content to be pushed on Twitter. Some of the content is on the fly and you can’t predict it, like entertainment news, but other content is known and can be scheduled, like birthdays or anniversaries. 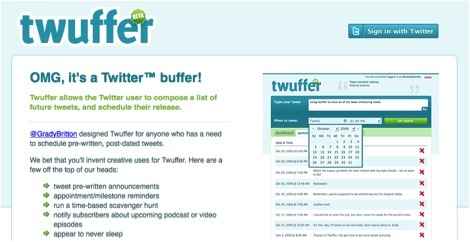 Use the Twuffer application to schedule tweets in advance. Try it: While you are logged into the company Twitter account, access Twuffer.com. Sign in using Twitter and the site will launch to Twitter asking for your approval. Once you approve the application, check out the Twuffer dashboard and schedule your tweets. The current top tier social media platform for millennials, Instagram allows your company to show off exclusive products, behind the scenes shots and fan art. Instagram encourages users to act “in the moment,” meaning one can capture a scene and immediately post it to the application. Because of this rule by Instagram, there is no application that will automatically post your content to the platform. But you could use Latergramme, which allows you to build and schedule your content. Once the schedule time is reached, Latergamme will send a notification to your mobile and alert you to post the content. Try it: Download the app Latergramme to your phone. Create your content and schedule the post. Wait until you receive a notification from the app and slide the post to open in Instagram. Latergramme will post using the Instagram user that is logged in on your phone. There is also a website to help with scheduling and creating content. This entry was posted in Advice, Internships on November 18, 2014 by TriSight.